I’m so excited to share a new meal prepping plan for those of you interested in meal prepping and wanting some more variety! I seriously love all of the meals on this meal plan! I think my favorites are the spicy cilantro chicken and the spicy fish taco bowl. I found these two healthy recipes on Pinterest and now I’m obsessed! You can find the recipes with my own cooking directions to these two meals here. I highly encourage anyone trying to eat healthier and/or wanting to try out meal prepping to check out these meal plans! There are three different plans so far! You can follow each of them each week exactly as they are or you you can definitely pick and choose what meals and snacks you personally like and put your own meals together. Feel free to comment on your thoughts, experiences, suggestions, etc! Also, don’t forget to post your meal prep photos on Twitter and Instagram as well as sharing this blog post on Facebook! Make sure to tag me on Twitter: @jacklyn_barrera & Instagram: @jacklyn_christine . I’ll be sure to post your meal prep photos on my Inspired Meal Preppers page! You can find all three meal plans here! Breakfast 1 toasted whole wheat English muffin with 1 turkey sausage patty, 1 cup strawberries and either 8 oz of 100% orange juice, skim milk or almond milk. 2 slices whole wheat toast w/ almond butter and banana slices, and Greek Yogurt 1 toasted whole wheat English muffin with 1 turkey sausage patty, 1 cup strawberries and either 8 oz of 100% orange juice, skim milk or almond milk. 2 slices whole wheat toast w/ almond butter and banana slices, and Greek Yogurt 1 toasted whole wheat English muffin with 1 turkey sausage patty, 1 cup strawberries and either 8 oz of 100% orange juice, skim milk or almond milk. *I would prepare all of this food and portion it all out into your containers first before preparing the other meals because you may have enough food for more than the days I have listed on the meal plan. I prepare my breakfast each morning. I season the chicken and tilapia with a mixture of 3 spices to add some kick to it: cayenne pepper, ground cumin powder, and chili powder. I am currently taking an advanced community nutrition graduate course at Texas State University and was assigned to do a presentation with a partner on The Thrifty Food Plan. So for the past few weeks, my partner, Kelly and I have been doing extensive research on this topic. For those of you who do not know what the Thrifty Food Plan is, you can click here to learn a little more about it. In short, the United States Department of Agriculture’s (USDA’s) Supplemental Nutrition Assistance Program (SNAP), formerly known as the Food Stamp Program, gives income-eligible individuals and families a means through which to purchase approved foods at authorized food stores. These benefit levels are based on the USDA’s Thrifty Food Plan (TFP). The TFP is supposed to consist of low-cost foods that meet the Dietary Guidelines for Americans. It is intended to fit into the low-income population’s regular menu, as much as possible. The MyPyramid Food Guidance System was used to develop the TFP. The USDA has since replaced MyPyramid with MyPlate. Below you will find a podcast, blog links, and YouTube videos with people providing their opinions and experiences on the Thrifty Food Plan. Here’s an NPR podcast that talks about the Thrifty Food Plan in addition to food insecurity, hunger, and children’s health. Here are a list of links to personal blogs that provide their opinions and experiences on the Thrifty Food Plan. A family of three followed the Thrifty Food Plan for one week and documented their meals and experiences each day. After reading and viewing all of the provided information on the Thrifty Food Plan, do you believe the Thrifty Food Plan is a realistic/helpful tool for low income individuals or families to use? If so, how would you, as a nutrition professional, use the Thrifty Food Plan to help your clients and/or patients to stay within their budget means? If not, why not? Please post your answers to this blog and provide at least your first name. This will be your facilitated discussion submission! As I mentioned in a previous post, meal prepping is a great solution for those that are always on the go and don’t have much time to cook anything. It’s also an easier way for one to have full control of what they are eating so they aren’t tempted to just pull up at a fast food drive thru restaurant and eat meals high in fat, sodium, and sugar. I am very passionate about living a healthy lifestyle by eating healthy and working out all while I stay busy with work, an internship, and graduate school. Meal prepping may seem like it is a lot of work and takes lots of time, but through my personal experiences I can confidently say it is so easy, doesn’t use too much of my time, and is completely worth it! I created a digital story about a woman named Sarah that lives a very busy lifestyle. She wasn’t eating right because of her busy schedule and she started to notice her health decline. So Sarah decided to seek help from a registered dietitian to get advice on what she should do about her eating habits. 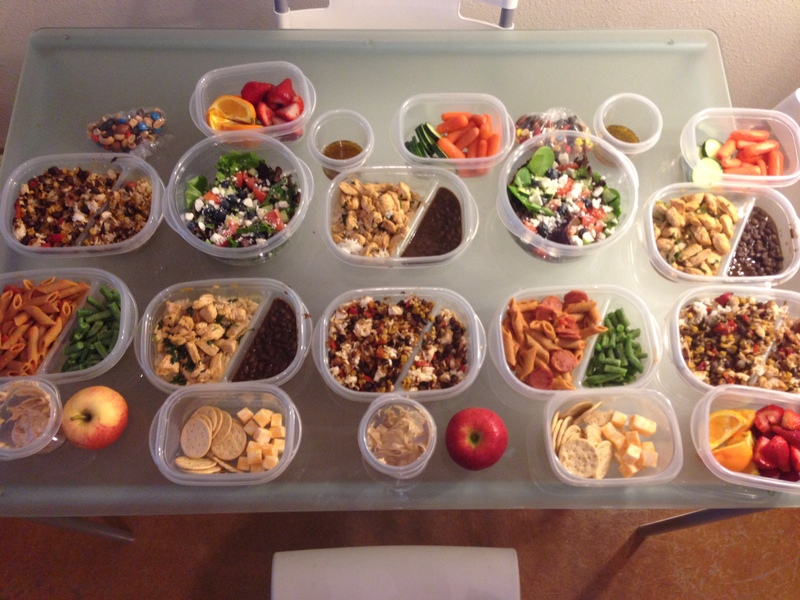 The dietitian wanted to keep things very simple with Sarah and recommended she begin prepping a week’s worth of healthy meals so all she has to do is grab and go for all of her meals. The dietitian wanted to keep the meal prep process simple and suggested she keep the USDA MyPlate guidelines in mind while meal prepping. The USDA MyPlate guidelines is a simple visual representation of what a well-balanced meal should look like. The plate recommends consuming half a plate full of fruits and vegetables, about a fourth of a plate of grains (making half of them whole grains), and another fourth of a plate of protein (lean meats). It also recommends consuming dairy that is low in fat. Click the link below to view the digital story on MyPlate and how to meal prep! My Fitness Pal is a great web application to use to help you achieve your ideal weight goals, whether it be weight loss, weight gain, or weight maintenance. I highly reccomend anyone trying to eat healthy and exercise to create an account and try My Fitness Pal out. This web app tool is free calorie counter, diet, and exercise journal and is also offered as a mobile application when you are on the go. It is a very simple application and is easy to navigate through. My Fitness Pal helps you keep track of the calories you have consumed for breakfast, lunch, and dinner and also provides nutrition facts for the amount of macronutrients in the food as well. It also gives you the ability to document your daily exercises, whether it be cardiovascular exercises or strength training exercises in order to calculate the amount of calories burned. By collecting the amount of calories consumed and amount of calories burned, the user will be able to see if they are consuming too few or too many calories and if they are exercising enough according to their weight goals. I created a screencast to show you some of the basic steps of how to use My Fitness Pal! Once you set up an account and input your height, weight, age, activity level, and ideal weight goals, you can quickly get started. The “Home” tab displays the total amount of calories you have remaining to consume based on your weight goals. It also displays the total amount of calories consumed, burned, and the net total for the day. The “Food” tab keeps all of the food you have eaten that day for breakfast, lunch, and dinner organized,as well as displaying the nutrition facts. In this tab you will also be able to enter the exact type of food you ate and will provide a large database of matching food items and brands according to what you searched for. And finally, the “Exercise” tab displays the amount of calories burned depending on the exercises you did for that day. You will be able to search through a large database of different types of exercises you potentially did to track the amount of calories you burned, whether it be walking, jogging, swimming, etc. Now go out and try it yourself! I use My Fitness Pal on a daily basis and it truly helps me with my weight goals. I know whether or not I need to eat a little more or a little less calories after each meal and can also see if I got enough exercise for the day. Good luck and happy calorie tracking! America is one of the most unhealthy countries in the world. About 65% of Americans are overweight or obese. Furthermore, one of the leading causes of death is heart disease. American’s poor dietary habits and lack of exercise is contributing to these alarming statistics. The nation is eating out more and as a result are eating larger portions and consuming foods high in calories, sodium, sugar, and fat. 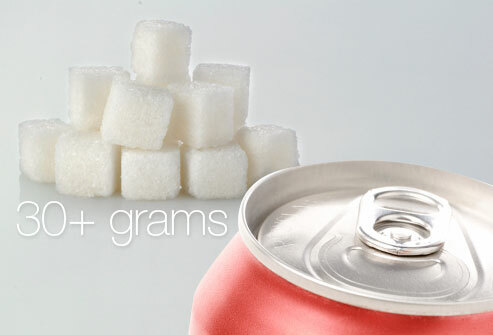 Another factor is the availability and cost of healthy foods at restaurants and grocery stores. Instead of city streets being surrounded by healthy food stores and grocery stores, they are occupied with fast food restaurants. This makes it very difficult for people of a low socioeconomic status to purchase healthy foods. Also, with rapidly growing technology, more children and adults are spending too much time sitting behind computers, video games, tablets, and cell phones instead of being physically active. There are many other factors that contribute to obesity but the above examples are the primary issues that can be changed and controlled. Cooking at home, reducing portion sizes, and eliminating unneccessary calories, fat, sugar, and sodium are just a start to achieving a healthy lifestyle. Furthermore, spending less time using technology and being more physically active will also get you on the right track to a healthy lifestyle. It’s the small changes that will slowly begin to improve one’s health. Below are some educational/informational videos on the obesity epidemic. Feel free to express your thoughts on this topic! Enjoy! I have a new recipe I would love to share with ya’ll! It is called a Greek Quinoa Salad and ohhh man is it good! I got this recipe from the foodservice kitchen that I work in as a dietetic technician. I believe they got this recipe from a website called Food Apparel. It has a great mixture of vegetables along with quinoa and a yummy homemade Greek dressing. I was inspired to make this meal one Saturday after I finished harvesting vegetables from a vegetable garden at Dell Children’s Medical Center in Austin, TX (I am doing an internship at Dell Children’s and help tend to their garden every week). 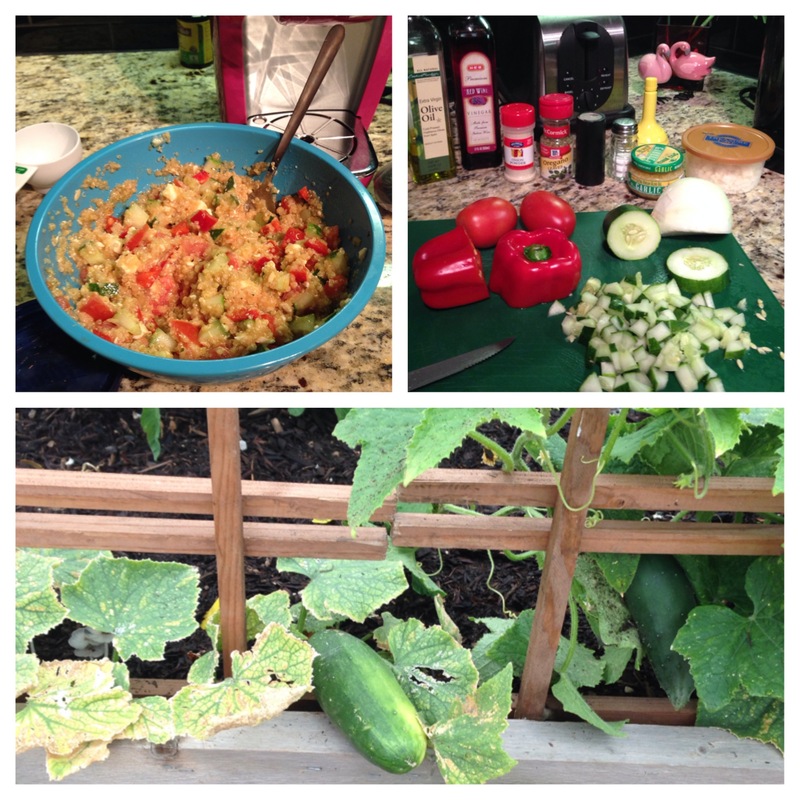 One of the vegetables I harvested was a cucumber and that made me think about this Greek Quinoa Salad! Nevertheless, I made the meal, tried it, and now I am obsessed. It is also a perfect meal for meal prepping because it does not need to be heated up and it makes a whole lot! The ingredients in the meal are very good for you and are very heart healthy. Not to mention it is a great mix of grains, vegetables, healthy fats, and low fat dairy. Add some grilled chicken and you are all set with a well balanced meal! Here is the recipe! I encourage ya’ll to try it and let me what you think! Meal Prepping for Those ALWAYS On the GO! I am a graduate student and have two part-time jobs. I work every day from 9am-5pm and then make a 30 minute commute to school where I sit in class from 6:30pm-9:20pm. By the time I get home each night, it is already passed 10:00 pm. Talk about having absolutely no time to make good meals for myself. Between work and school I would pick up food from Sonic, Wendy’s, or Popeyes. For the longest time, I often found myself too tired or stressed to eat. Once home from school, I would resort to eating a bowl of cheerios or would completely skip dinner. Let me just tell you, this is definitely not the way to go! All of the fast food meals were extremely high in fat and sugar and did not give me an ounce of energy to get through my classes each evening. Aside from that, I was not helping my overall health out at all. I struggled with my weight with my type of lifestyle and knew that I needed to change my habits. After consulting with healthcare professionals, I decided to take the next step towards eating healthier. I began meal prepping! I found this to be the easiest and best thing for me considering my daily schedule. Every Sunday I plan out what I am going to eat for breakfast, lunch, and dinner as well as snacks. I then create a grocery list, go grocery shopping, and begin the meal prepping. I purchased lots of fruits and vegetables as sides and snacks, lean ground turkey and chicken breasts, brown rice, black beans, and whole wheat pasta. The whole process of buying groceries and cooking takes me no more then 2 1/2 hours and I have my meals ready to heat up and eat for an entire week! Meal prepping changed my eating habits and I could not be happier to be on this weekly regimen! Now, if you are interested in meal prepping, see below for a sample grocery list and weekly meal plan. The name of the game for healthy meal prepping, is BALANCE! Make sure to have a balance of fruits, vegetables, lean protein, low fat dairy, and of course some whole wheat! Feel free to comment with any questions or suggestions! *I would prepare all of this food and portion it all out into your containers first before preparing the other meals because you may have enough food for more than the days I have listed on the meal plan. Therefore, meals like the spinach salad and tuna with crackers may not be necessary. It is up to you! For breakfast, I prepare the toast and smoothies in the morning. In my smoothie, I fill up my magic bullet with around ½ -1 cup of mixed frozen strawberries and bananas. Then I pour around 1½ cups of almond milk. I pour ¼ water in as well and then a scoop of whey protein powder. To add more flavor to the ground turkey, try adding sautéed green peppers and onions. Sautee them in olive oil then mix it in with the ground turkey while cooking. Siracha sauce is one way I add flavor to my food. However, be aware that Siracha sauce contains quite a bit of sodium. 1 tsp= 100mg of sodium. The daily recommended intake of sodium according to the American Heart Association is 1500mg per day. Season your chicken and tuna with Mrs. Dash seasoning (there are tons of different seasonings). Mrs. Dash is a non-salt seasoning but still adds great flavor to food. Using Mrs. Dash instead of regular salt seasoning will reduce your sodium intake to maintain good heart health and reduce your risk for heart disease. For the snacks, I don’t have exact measurements but I would not portion out more than two handfuls of each snack.